Discovering triathlons at the end of the season meant that there weren’t too many opportunities to compete this year, so it was a 2 hour drive across the country for the Lincoln Junior Tri. Flo was the only one competing and was in one of the last waves of the day of the 18 girls 20 boys in the TriStart event. 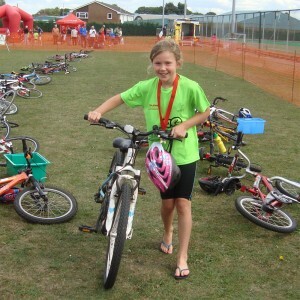 The race started well and Flo was first out of the pool by about half a length, trainers on and a good sprint to the bike. The bike route was on a tarmac track and all the way round was battling to keep herself in the lead but was overtaken coming into the transition but then had to avoid the girl in front as she tumbled to the floor leaving Flo in the lead again. The run went really well, in the lead all the way but a little tired and over the line first in her wave, 8th overall and 20th in her age group. Hats off to Lincoln for their event, amazing organisation and atmosphere and a great day of racing.